Rainy fall days are here, and they are forcing my windows open. After a heavily air-conditioned summer, it feels good. It feels cheerful and familiar, the chilly air of fall – that telltale nippiness that signals the yearly return of football, hot coffee, and the Northeast cable knit mafia. Welcome, all. And then there is the soup. 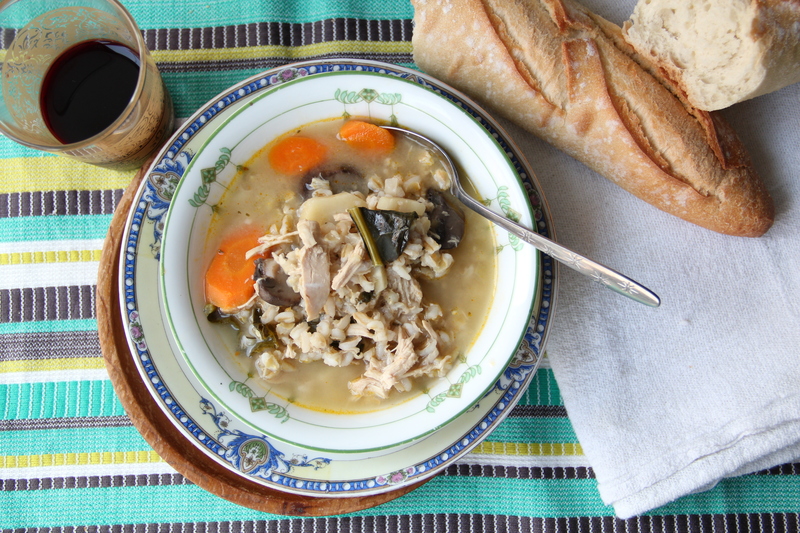 As the cooler months stake their claim around us, we can do nothing but eat soup to be happy. This is an old Chinese proverb. Probably. 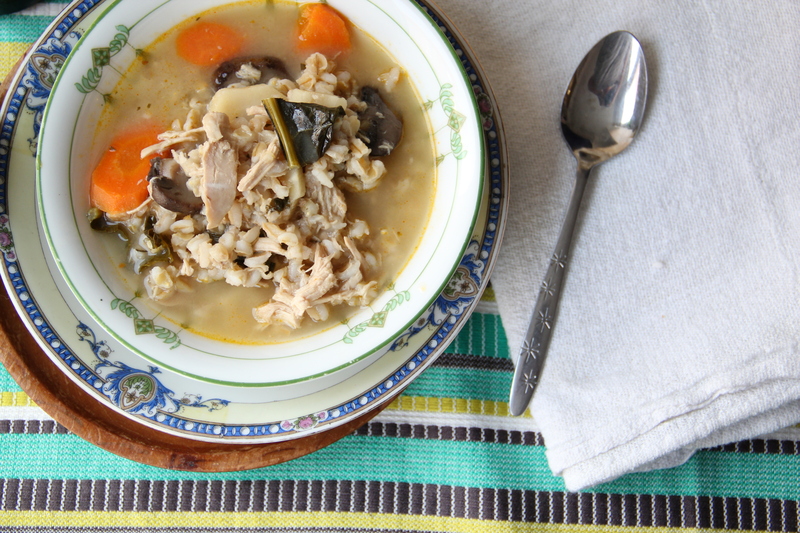 This soup keeps the warmer months alive with its vegetabley lightness, but the addition of pearl barley, mushrooms and shredded chicken helps to welcome heartier months ahead. In a large stock pot or dutch oven, heat the olive oil over medium high heat. Add the onion and sweat gently, until soft. Add the celery, carrots and parsnip and sauté for 5 minutes, until softened. Add an extra big pinch of salt, some pepper, fresh thyme, bay leaf and herbs de provence, and cook an additional 2 minutes or so. Add the pearl barley and stir to coat with olive oil. Let the barley toast in the pan for a few minutes before adding the chicken stock. Bring to a boil, then lower the heat and simmer the soup until the barley is tender, about 40 minutes to an hour. Once the barley is just tender, add the mushrooms, kale and chicken to the pot and cook until the chicken is heated through. Season with more salt, to taste, and serve with a hunk of crispy bread. This soup freezes well – just let the soup cool before scooping it into a freezer-safe storage container. It will keep for about 3-4 months frozen. Makes roughly 16 cups (or 4 quarts) of soup. This looks fantastic, chef molly!! I will add it to my soup recipe collection and make it before too long. You are officially my cooking hero after seeing and eating your INCREDIBLE desserts this weekend; I honestly have never seen anything like it before! you make me laugh out loud! this is a chinese proverb. probably. by the way, i love your new year resolutions. The Chicken and Barley with Kale soup is excellent! Such a large portion too! Thanks for the recipe, I also made the Sour Cherry Cupcakes really good, I used my frozen cherries grown here in northern Michigan. Thanks Becky! So happy you’re enjoying! haha fantastic! thank you for the comment, Patricia!